Executive High Back Chair features double pillow cushioning on the seat and back along with padded armrests under Techniflex upholstery, a premium synthetic leather. The higher back provides great support, while the pneumatic seat height adjustment lever and chair tilt lever with tension control knob allow you to easily customize it to your personal preferences for the most comfortable, ergonomic experience. A 5-point nylon base and non-marking nylon wheels lend to the mobility, stability and durability of this chair. Keep your office looking professional by equipping workstations with the TECHNI MOBILI RTA-709M Medium Back Leather Executive Office Chair. 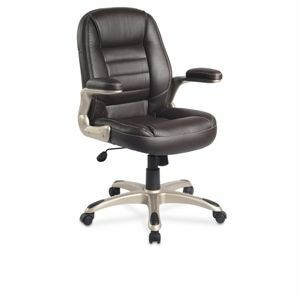 Your personnel will appreciate this chair, with its Techni-Flex upholstery that simulates that soft leather feel felt in many high end office chairs. And with its lumbar support, you can expect better productivity since many will experience less back pain with this chair. Features: -Double Pillow Soft Cushion Back Support. -Padded Armrests. Pneumatic Height Adjustment. -5" Adjustable Back. -Heavy Duty Steel Base. Made with comfortable black Techni-Flex upholstery, this classy chair looks and feels like real leather. Featuring soft padded molded arms, an adjustable seat that shifts 17"-21", built-in lumbar support, locking and tilting mechanisms, and tension knob adjustment. Alternate: bMobile mobile: 1-868 768-2328, 777-6299, Digicel mobile: 1(868)356-1030.